JUVÉDERM VOLUMA XC is the first and only FDA-approved hyaluronic acid-based filler specifically designed to correct age-related volume loss in the mid-facial region. While other cosmetic injectables can be used to minimize the appearance of fine lines and wrinkles, JUVÉDERM VOLUMA XC is best suited for large scale volumizing. The natural aging process can cause the skin in the cheeks and mid-face to sag and flatten. 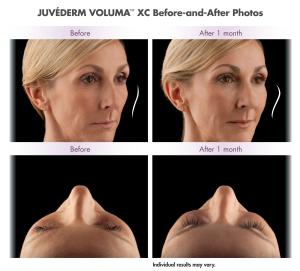 JUVÉDERM VOLUMA XC is designed to restore lost volume, re-contouring the face for a more youthful and rejuvenated appearance. Patients 21 years of age and over are eligible for this treatment. A tiny needle is used to inject the JUVÉDERM VOLUMA XC solution into the desired areas. The solution contains a local anesthetic that can minimize discomfort during treatment. Typically, the procedure takes about 30 minutes to complete, and most patients can immediately return to normal daily routines. Some redness, swelling, or bruising may occur after treatment, but any side effects generally subside quickly. Results can last up to two years, offering longer-lasting benefits than many other cosmetic injectables! For more information on JUVÉDERM VOLUMA XC, or to schedule a consultation to discuss your goals, please contact us today.